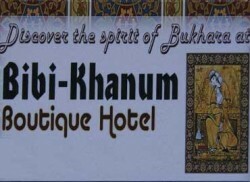 Boutique Hotel Bibi-Khanum is located in the old part of Bukhara city. It will take only 3 minutes of walking to reach the ancient center of the city, Lyabi - House Complex. The building of the hotel belonged to the end of the 18th century. It was a residence of the Vizier of Bukhara. Nowadays it is a unique combination of reconstructed ancient premises and newly built rooms. Aiwan - a traditional open terrace, has 3 ancient columns wooden carved. There are 8 rooms in the hotel. Famous designers of Bukhara worked out room interiors.